Christ Church Schola Cantorum (aka Schola Cantorum) is a vocal group of the Christ Church Rochester (Episcopal) in downtown Rochester. The group takes its name from the Schola Cantorum, or Papal Choir from the time of Gregory the Great. 1. Some of the following may be material from the group's CD liner - see Christ Church web page. The vocal group performs the weekly Office of Compline at the church on Sunday evenings at 9 p.m. (October through April). Compline is the name of the last Office (service) of the monastic day - a ceremony of closing prayers before bed. Its origins date back to the 4th Century monastic custom of private prayer and devotion before retiring. St. Benedict is responsible for the name of the office, its liturgical character and arrangement. The group sings the Compline Service a cappella (without accompaniment) and combines Gregorian chant and early, baroque, and twentieth-century sacred motets. Compline is brief (30 minutes) and performed entirely by candlelight. This restful and serene "service" allows listeners to pause and reflect at the beginning of one week - or the closing of another. CC Compline is free (donations accepted) and everyone is welcome. A prelude on the Craighead-Saunders organ is played as the audience arrives. On the first Sunday of each month, Compline is preceded by a Candlelight Concert beginning at 8:30 p.m. featuring area musicians. Free parking is available in the lot on Lawn Street behind Christ Church. The Christ Church Schola Cantorum is recognized nationally as a leading ensemble for the performance of early sacred choral music and chant, contemporary music, and choral improvisation. 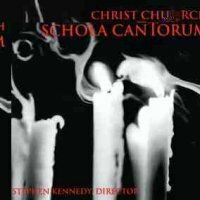 The Schola has produced two CDs, both available through GOTHIC Records; the most recent is a recording of the music of David Conte released on the ARSIS label in 2008. Schola recordings have been broadcast nationally on Minnesota Public Radio and Richard Gladwell's radio show With Heart and Voice. In addition to singing compline, the group performs regularly for local music festivals and concert series such as Eastman's annual EROI Festival, the Rochester Early Music Festival, Music at St. Anne's series, the Memorial Art Gallery, Elmira College Concerts, and others. Kennedy is the founder and director of CC Schola Cantorum, is the music director at Christ Church and Director of Chapel Music and Instructor in Liturgical Music at Bexley Hall Episcopal Seminary. He also teaches at the Eastman School of Music and Nazareth College. He has been a performer and lecturer for local and regional events of the American Guild of Organists, and has given choral workshops in the U.S. and abroad. He composes liturgical and choral music as well as chamber music and compositions incorporating computer-generated sounds and improvisation.